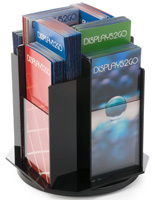 Great for Tradeshows & Offices! 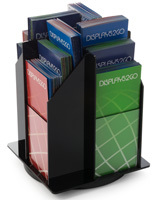 Stores 16 Sets of Brochures! Sleek Black Finish, Clear Accents! 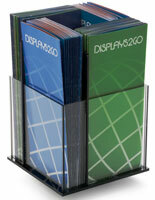 This acrylic booklet holder is perfect for tradeshows, offices, hotels, hospitals, real estate offices, and much more! 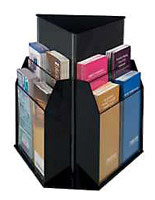 This store fixtures system features four tiers and pockets, resulting in 16 options for showcasing stacks of promotional literature. 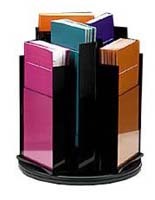 This acrylic booklet holder that is a rotating pamphlet rack draws the immediate attention of prospective customers. 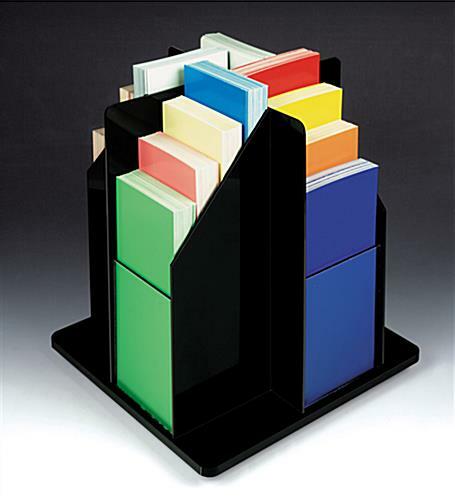 This 16-pocket fixture, like business stands, has staggered pockets, so contents are always visible, even from the back! 11.5" x 12.3" x 11.5"